This awesome waterslide is sure to provide an all-day thrill ride for kids and adults of all ages! It is one of our most popular waterslides, so be sure to call in advance. You don't want to miss out on this unit! 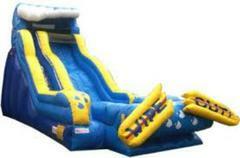 The Wipeout offers a soft landing at the bottom and measures approximately 19' tall, 36' long & 14' wide.